Not just anyone can gain access into the Heart-of-House at Marina Bay Sands, unless you are one of the 8,000 staff or you are under some official business with someone inside. Even so, you still have to go through the security procedures, that involve ID exchange for visitor's pass. I was none of the above, hence I feel deeply privileged to be allowed access into the throbbing heart of the underground mini city. Even more so, as the Executive Chef of Marina Bay Sands himself, Chef Christopher Christie, took us on a tour around his turf. The first thing that I noticed after we were past the security gantry was Seven Eleven convenience store. Mind you, this store is not openly accessible to the general public, so it tells just how many people are going in and out of Heart-of-House, that Seven Eleven sees the need to sell those brain-freezing Slurpees down here. 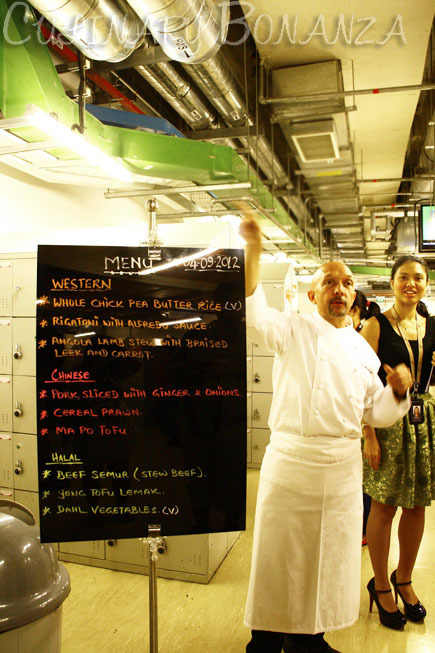 Chef Christie took us around the labyrinthine underground food factory where all the culinary wonders at Marina Bay Sands were made possible. One door led to another, and some rooms have multiple doors with fixed order of entering and exiting. This is done to ensure that the food flows in the right order to minimize contamination. We were brought around the extremes, from freezing chiller rooms, to warm and sultry chambers where the pans and ovens are whirring & cooking. "As long as the tile is terracotta red", said Chef Christie, "it's my turf". The effervescent chef handles extraordinary tasks unlike any executive chefs elsewhere, due to the massive scale of operations at Marina Bay Sands with its 2,561 rooms and suites, 24/7 casinos and convention centres. 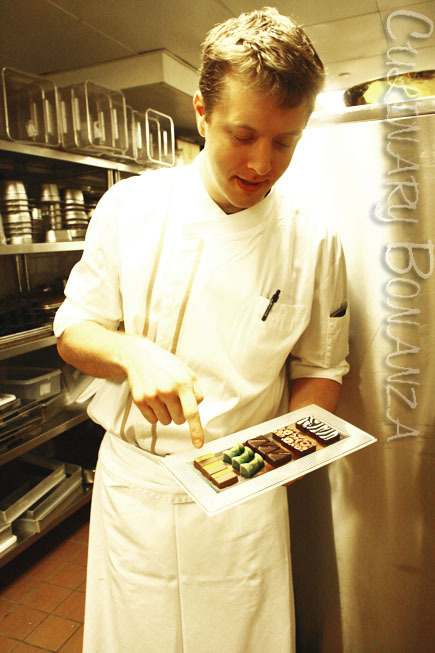 Chef Christie heads 400-strong culinary team, 43 individual kitchens, some of which are operational 24/7. He also supervises the two Team Member Dining Rooms (TDRs) accessible 24-Hours, that dish out some 7,000 meals for the staff alone, 7 days a week. And not to forget the in-room dining service, banquet and catering services for the convention centres. All in all, some 20,000 meals are prepared daily under Chef Christie's eagle-eye supervision. The numbers are intimidating, but being in Chef Christie's shoes is even more so. However, with almost 30-years of experience under his apron, we can sleep sound at night and be sure that food will appear anytime, upon our wish. Our senses, particularly olfactory sensors, had a major exercise, as we moved from one room to another. From gamy odour in the chiller rooms where they store and prepare meat, vegetables and fish, to the piquant air in the Chinese-food kitchen and rich buttery whiff of bread baking in the gigantic ovens. And then the Executive Pastry Chef came to say hi us, or rather, we stumbled upon him as we were entering his turf: the bakery and sweets section. Anything that's got to do with dough, bread, sweets, chocolate, confectioneries, pastries, will be his responsibility. 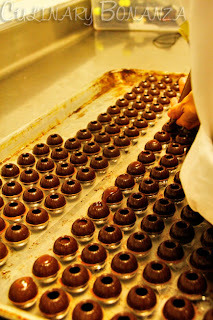 He kindly let us into the chocolate room where 2 chocolatiers were piping chocolate filling into hollow chocolate shells, I would have sneaked a piece or two had there not be so many people in such a small room. The ambrosial scent of chocolate filled the entire room, I would volunteer to get locked up inside here. Chef Witcher then rewarded us (for interrupting his work) with a platter full of fine pralines that are sold at Sweet Spot dessert cafe above. I regretted not clearing the entire platter when each of my friends timidly took only 1 piece. Our next stop was the Team Member Dining Room or TDR as the staff fondly calls it. 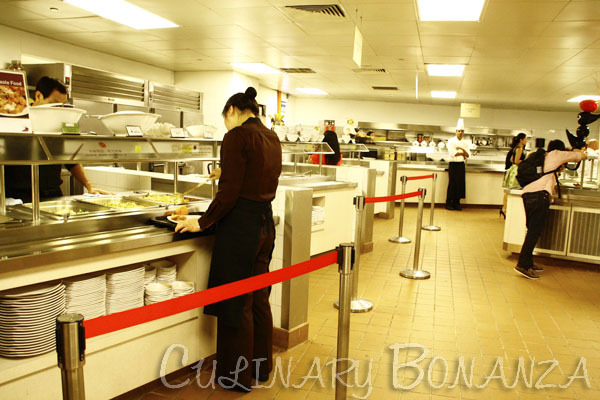 It's a staff canteen that serves 5 star hotel standard meals, buffet style. The variety is wide to cater to the dietary preferences (halal, vegetarian, chinese, western) of the staff from every ethnicities and backgrounds. The big dining room was even replete with a free flow of beverages that would put my old boarding school to shame! After the kitchen tour, we were led into the wardrobe enclosure. Notice that I don't use the word room, because this space is cavernous but stuffed with siding hangers that rise all the way up to the ceiling. 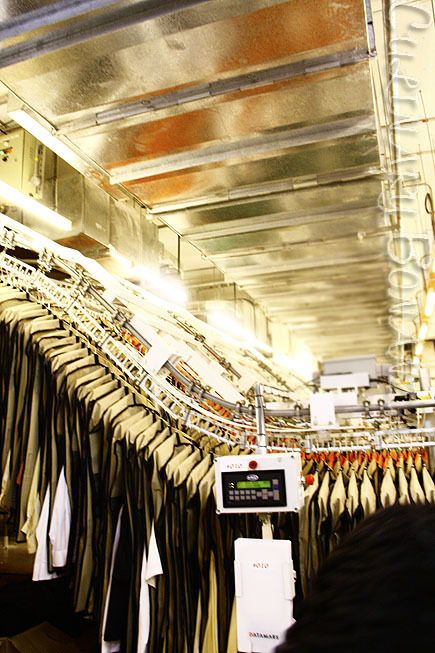 The automated hangers keep the outifts and uniforms of the staff here. Everyone need only tap their staff ID card at the reader at each of the designated doors on the walls outside the wardrobe room and then his/her uniform will shuffle along the rail and stop at the right door, fresh and neatly pressed. Some 9,000 uniforms are laundered daily, there's no room for mistakes here. The wardrobe department also consist of 5 seamstresses who are ready to make alterations at times of sartorial malfunction for anyone, the staff and hotel guests alike. Each of the staff uniforms has RFID (Radio Frequency Identification) tags stitched into them. This tracks the frequency of washes and the location, besides aiding the team to decide when to replace the set of uniform with a new set.